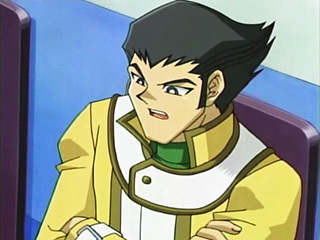 Bastion Misawa – A highly analytic duelist, Bastion is portrayed as a mathematical genius who covers his cards and the walls of his room with endless numeric formulas, believing that everything in life can be calculated arithmetically. The neglect of his character is a running gag throughout the series. In the timeline of the Yu-Gi-Oh! GX anime, coming in #1 in the entry examinations for Duel Academy, Bastion meets Jaden Yuki during the first year, watching him defeat Vellian Crowler. Due to his astounding performance in the exams, Bastion is placed in the Ra Yellow dormitory after being accepted to the school. Upon defeating Chazz Princeton in a public Duel, Bastion is offered entrance into Obelisk Blue, but declines, saying he promised himself he would not advance to Obelisk Blue until he was the #1 freshman of the school, and in order to do so, would have to defeat Jaden, who he viewed as #1. He builds a seventh deck, seemingly based on his Water deck, devoted to sealing certain cards so that an opponent will not be able to summon most of his or her monsters. Bastion uses the seventh deck against Jaden, preventing the use of Polymerization with Cursed Seal of the Forbidden Spell, therefore keeping Jaden from calling forth his stronger monsters, but is still defeated. Due to his skill, Bastion is one of the seven duelists that received a key to the Spirit Gate that can unleash the Sacred Beast Cards. Bastion only duels one of the Shadow Riders, Tania. Although Bastion uses his Magnet monsters, which use opposing plus and minus charges to stop his opponent’s attacks and fuse to become stronger, he eventually loses. Afterwards, he is stripped of his free will to a degree and becomes infatuated with Tania, but returns to normal after Jaden defeats her in a Duel. At one point during the second year, angered by the fact that he was not considered for entry into the Society of Light, Bastion challenges Sartorius to a Duel in order to prove his strength and disband the Society. 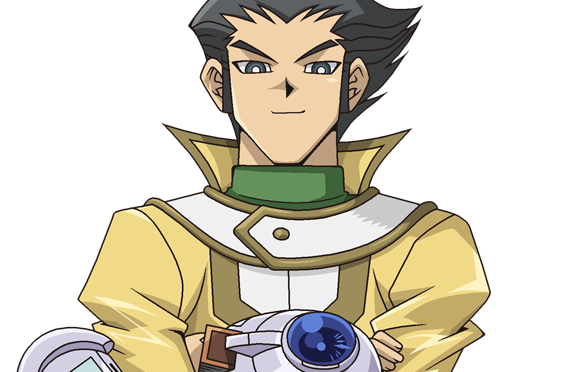 Chazz, however, takes Sartorius’ place, and although Bastion has the means of being victorious, Sartorius takes advantage of his self-doubt and desire to be accepted, convincing him to intentionally lose to Chazz and finally join the organization. This was his only duel shown in season 2. Following his conversion, Bastion is relegated to the sidelines, watching helplessly as other Society members are given the opportunity to duel Jaden and convert other school members into their group, while he himself is assigned no such tasks. After weeks of such torture, as well as a conversation with Dr. Eisenstein, he grows “enlightened” about his worth as a duelist and as a person, strips himself of his clothes and leaves the Society of his own accord to pursue his goals, running through the school in Archimedes-inspired fashion. This occurs in episode 96, in the 4Kids dub, he is not fully naked and wears boxers unlike the original Japanese version. He follows Eisenstein to his laboratory, where the two study quantum mechanics together, but an experiment deposits Bastion in an alternate dimension where the rest of Duel Academy would later join him. He later joins Jaden in going to the other alternate dimension to save Jesse, encountering Tanya again. Prior to Jaden’s duel with Yubel, Bastion decides to stay in the alternate dimension with Tanya and her friends, and he doesn’t return to the real world when everyone else does. In the English version, Bastion speaks with a British accent. Bastion has six decks, each based on an Attribute, and a special seventh deck made to combat Jaden. Underneath his jacket, he wears a special vest that holds six of the seven decks (Fire, Earth, Wind, Water, Light, and Dark). Each deck runs on a specific theme, with his Water deck’s theme being the fusion of hydrogen (Hydrogeddon) and oxygen (Oxygeddon) to form water (Water Dragon), and his Earth deck’s theme being the manipulation of plus and minus electronegativity. His remaining four decks were never featured in any episode During the second year, he merges his six decks into one that is the most balanced amalgam of all his cards, though once again, four of the types were never seen. In the manga, Bastion plays a Yo-kai deck, which relies on the summoning of monsters from Japanese folklore from his Graveyard.